How Do Translation Devices For Church Work? Are you looking to provide an audio translation of your worship services? Well, you have come to the right place. This article will help you decide which is the best translation system for your church. Now before I get started let me get something out of the way right away. There is no product on the market today that will do this without a human translator. There is a prototype out there, but so far, nothing has been released to the general consumer market. However, that doesn’t mean that with a little ingenuity and a dedicated volunteer, you cannot serve the people in your congregation and community with language translation into their native tongue. 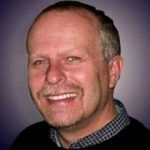 The purpose of this website is to make church technology quick and easy. So I have included links to Amazon for the products that I mention. I have found that it is a better use of my time to use Amazon rather than spending hours driving around shopping for tech. I spend 15 minutes buying on Amazon, and in 2 days it shows up on my doorstep. I can use the time saved for study, prayer, or visitation. Now for those of you that want to find what you need and don’t need to research this topic, here are the products that I am recommending. Translation systems for churches are pretty straightforward. You have three main parts. 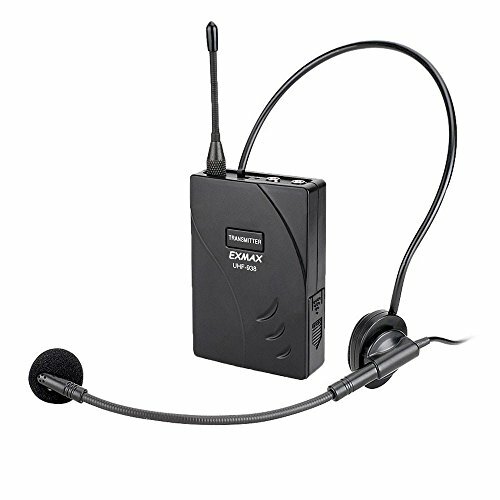 The headset microphone that the translator wears when translating your services. 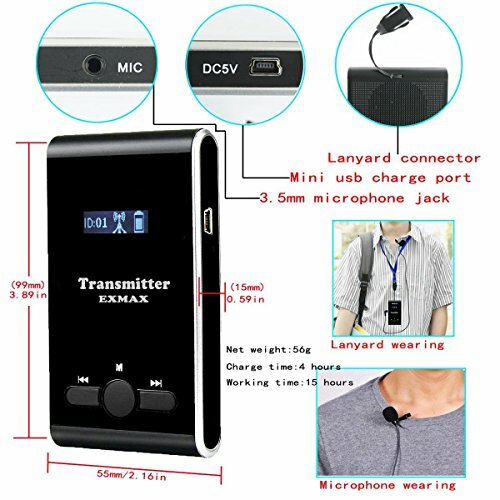 The translation transmitter that the translator’s microphone is hooked to that transmits the language translations to the people. 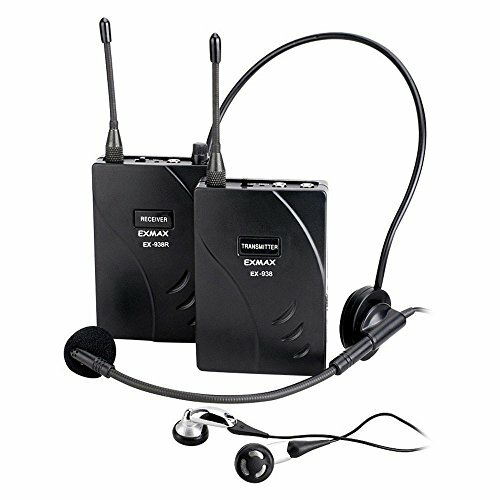 The translation receivers and headsets that are worn by the people receiving the translation. The person translating your worship services needs to be able to hear what is being said. Either they are located in the sanctuary at the sound system booth, or they are in a soundproof translation booth that has an audio feed to their booth. They then take what is being said and translate it into the language of the people that are listening to them. They speak into the headset microphone, and it is broadcast to the people. The people who are listening place either headphone over their ears or earbuds in their ears. They can adjust the volume control to their comfort level. If you have multiple languages being translated, then you can get translation systems that will broadcast on different frequencies so your translator of language one can translate for one group of people and a different translator can translate language 2 to another group of people. You can get systems that will handle up to 6 separate languages. How many people will be receiving translation service? How many languages need to be translated? Where will your translator/s be located? Will they be In the sanctuary? Alternatively, at the sound booth? Will they be found in a separate room? 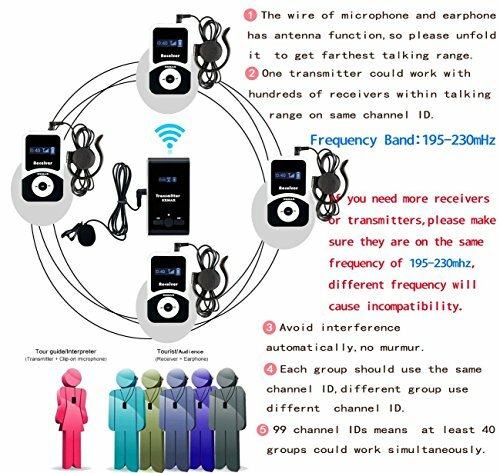 If you have more than one language being translated, how many receivers do you need for each group? Is our translation system going to be portable or stationary? 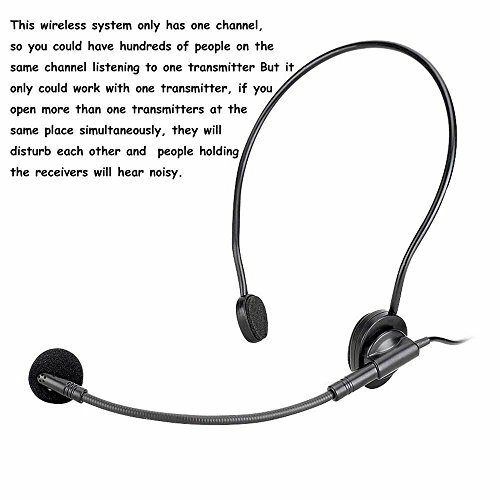 Most of us do not need a fancy wireless translation system. We are only trying to translate sermons and worship services. We are not translating private information or trying to broadcast over long distances. Here are a few things to look for when choosing a translation system for your church. Unless you need to translate services for over six different languages, or you are translating private information that could involve privacy issues, you do not need an infrared system. Infrared systems are more designed for extensive translation services, or for maintaining privacy. Once again the need for digital is overrated. Most systems come with a wide range of frequencies to choose from so there is no problem with finding a clear signal. If and when digital infrared technology comes down in price, then maybe there would be a need to switch to digital. However, the price advantage with analog makes it a wiser investment for a church. Are you a church plant? Do you have to set up and tear down each Sunday? 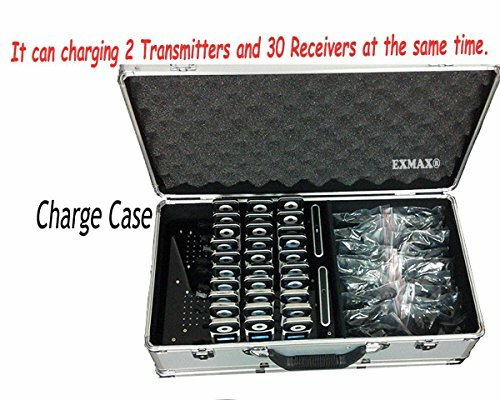 If so then you will want a system that is quickly set up and can be stored in a travel case. If not, then this is not as important. All the systems I have recommended comply with FCC regulations. If you are in another country besides the United States, then you might want to check your local rules about transmitting FM signals. Most churches have just one language that needs to be translated. However, there are times when you need to translate English into more than one alternative language. 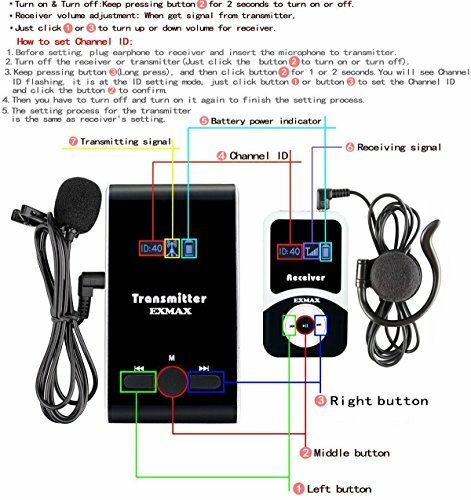 For each language you need to translate your services into, you will need a transmitter for that language or a channel that your transmitter will let you use to control which language goes to which receivers. 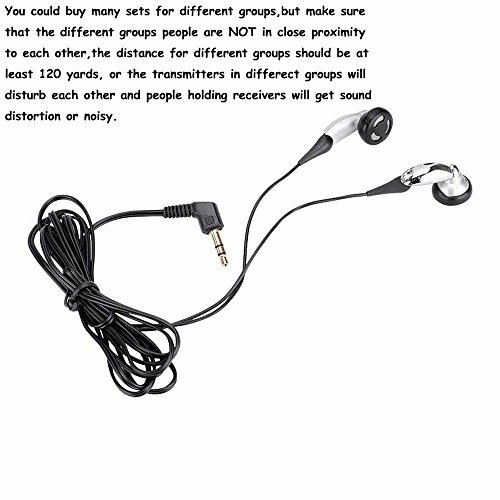 This is a wireless headset system which could transmit the voice of person who speak to the microphone of transmitter to the people who wear earphone of the receiver,the transmission distance is about 50 meters(164 ft).The disadvantage is that you couldn't open two or more transmitters at the same place simultaneously, or they will disturb each other. To avoid this disturb, the distance of different transmitter should be at least 120 yards. 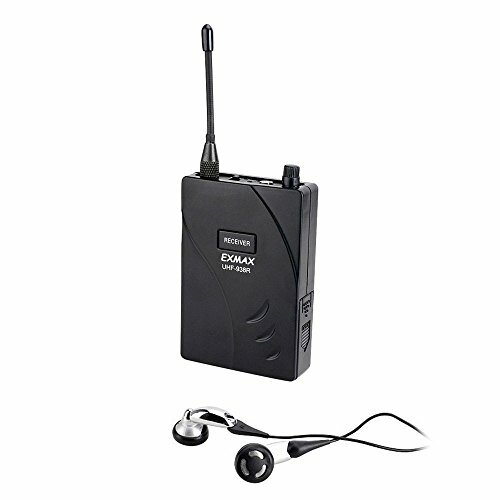 This UHF-938 wireless system only have one channel, the frequency is 433 MHz, it has two input jacks, AUX and MIC, AUX is for external audio inputting, such as music playing from CD or MP3 player, MIC is for real-time human voice inputting,such as teaching, training, touring etc. 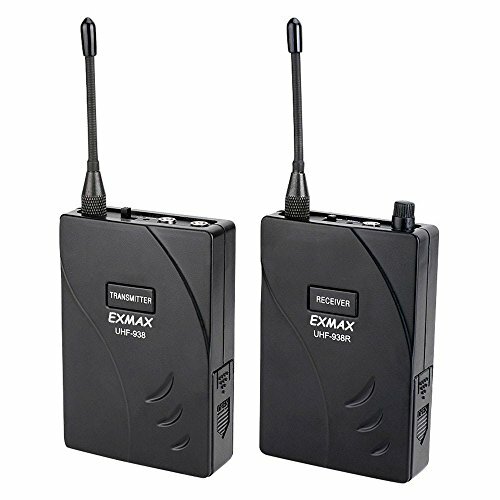 You couldn't mix up the two jacks, or you will get noise.Since there is only one channel for this wireless system, the advantage is that it is very easy to operate. 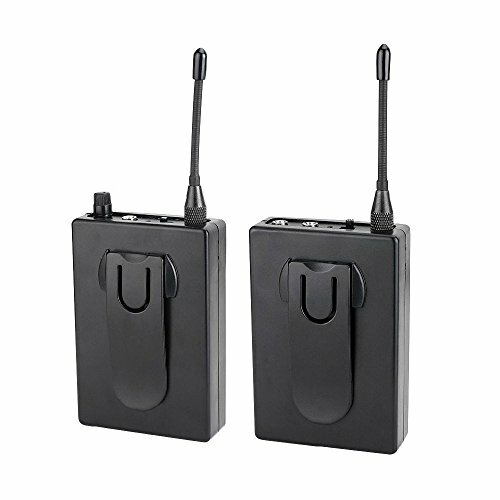 On each group,one transmitter can work with multiple receivers within the operating range.Low-power consumption design, 2pcs AA battery(NOT Included) can work more than 18 hours.The transmitter and receiver and headphones offer convenient, hands-free operation. Kindly note that This system requires a human language interpreter, it does not translate automatically. NOTE before Buying: Please DON'T buy many or large quantity sets/units one time if you never operated this system before or don't know what it is for. Strongly advise customers just to buy one set/unit to test this system and completely understand its functions and know its advantages and disadvantages. This unit comes with ten receivers and will handle the translation needs of most small churches. 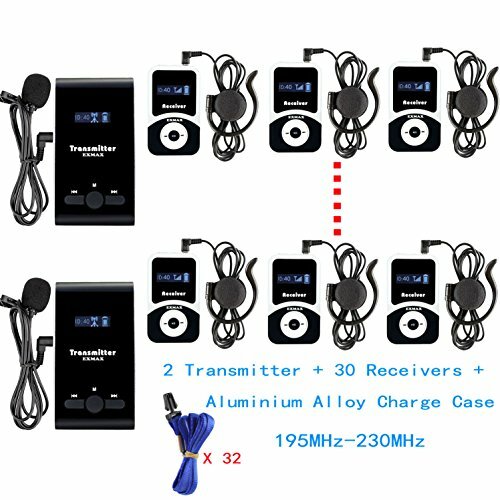 It has great customer reviews, and the biggest complaint was that the receivers were not rechargeable but used batteries. However, you can use rechargeable batteries. NOTE before Buying: Please DON'T buy many or large quantity sets/units one time if you never operated this system before or don't know what it is for . Strongly advise customers just to buy one set/unit to test this system and completely understand its functions and know its advantages and disadvantages. This church translation system will fit the needs of most medium-sized churches with one language to translate. 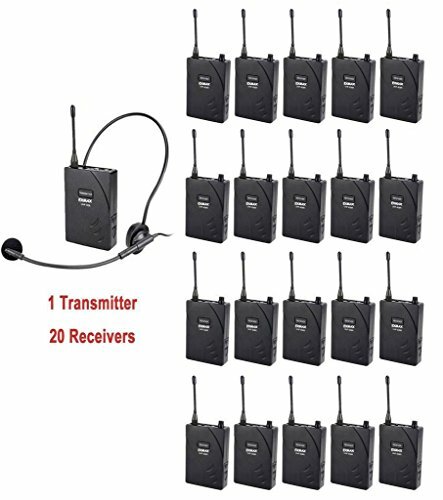 It comes with 20 translation receivers and headsets. It also has excellent customer reviews and the same complaint as the smaller version. 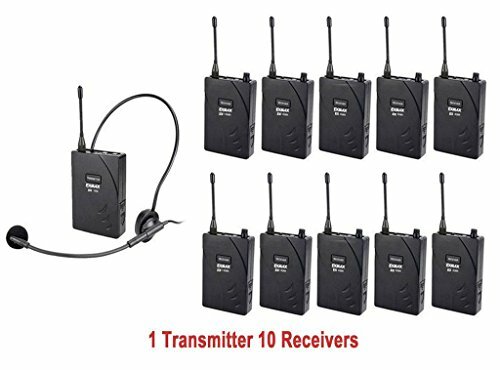 If you are a larger church or have many people who speak different languages, then this unit will do the trick for you with 30 receivers and two channels that can be used for one language each. You will want to think ahead about how many translation headsets you may want to use in the future. Although I am sure that you can purchase extra headsets, I have had the experience in the past that after a couple of years, things or systems are upgraded, and you cannot get what you need any more. So think ahead and buy more than what you currently need if you feel your people who are going to use your translation system will increase. 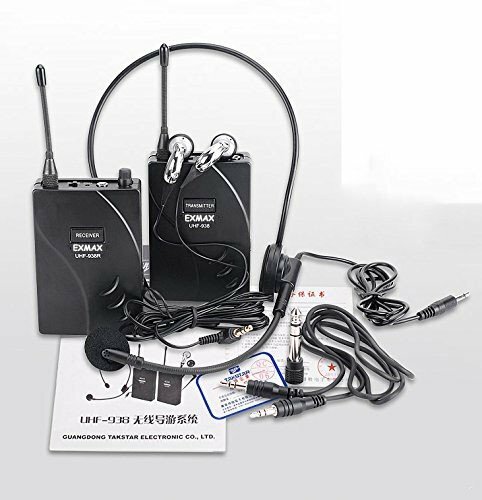 Here are a few accessories you may need with your wireless translation system for your church. 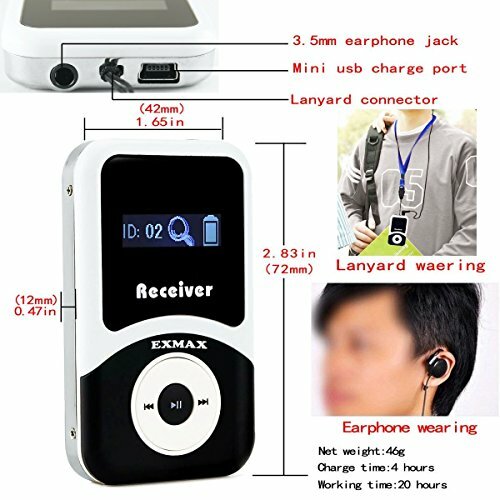 A headset microphone for your language translation volunteer. 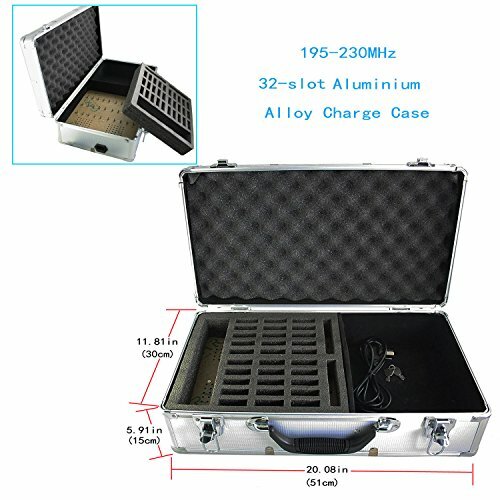 A case to keep your equipment safe and secure. With our communities changing before our eyes, all of us are faced with the question of how do we reach and serve those in our society that speak a different language. These translation systems for the church are a great way to meet that need. Even if you have to hire a college student for a couple of hours a week to translate your services, those within your community that speak a different language will appreciate your effort to reach out to them. The gospel is for every tribe, tongue, and nation. It is time we all made it available to everyone who lives in our communities.